BEECO offers a wide range of sanitary shell & tube heat exchangers that are custom fitted for every application. Common Industries served include the food, dairy, beverage, pharmaceutical and Biotech markets. With over 40 years of experience in this field, we are able to provide you with the engineering expertise to recommend the right heat exchanger that will meet your needs. Please feel free to contact us for more information and to find the right heat exchanger for you. 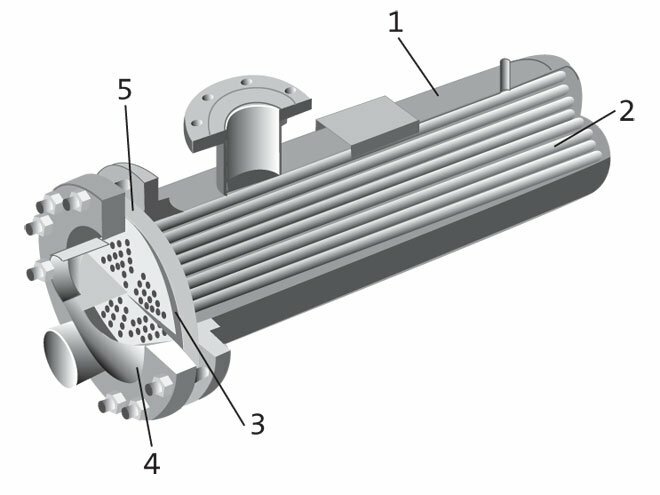 A shell and tube heat exchanger is the most common type of heat exchanger in oil refineries and other large chemical process, and it is suited for higher-pressure applications as well. As the name implies, this type of heat exchanger consists of a shell (a large pressure vessel) with a bundle of tubes inside it. One fluid runs through the tubes, and another fluid flows over the tubes (through the shell) to transfer heat between the two fluids. This set of tubes is called a tube bundle, and may be composed by several different types of tubes including: plain, longitudinally finned, etc. Enerquip's Sanitary Grade shell and tube heat exchangers offer superior performance in every application.